Former U.S. Ambassador William Garvelink will speak on the three global challenges facing us: pandemics, corruption and failed states. Ambassador (ret.) William Garvelink at Calvin College's Gezon Auditorium, Thursday, May 31, at 6:30 p.m.
William Garvelink, former U.S. Ambassador to The Democratic Republic of the Congo, will speak on “Global Trends Driving International Relations” at 6:30 p.m. on Thursday, May 31, in the Gezon Auditorium at Calvin College. Garvelink believes that pandemics, global corruption and failed states have been the three forces causing ripple effects around the world. He currently serves as senior advisor for global strategy at the International Medical Corps. Serving as a U.S. 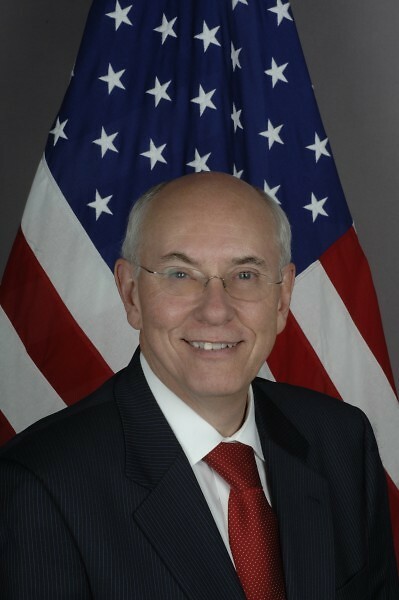 Ambassador from 2007 to 2010, Garvelink’s work prior to that was at the U.S. Agency for International Development (USAID), where his responsibilities included oversight of the agency’s worldwide humanitarian assistance and democracy programs. Garvelink spent 1988-99 in the Office of Foreign Disaster Assistance (OFDA), working around the globe to conduct assessments and direct relief operations. He also served for two years in the Department of State’s Bureau for Population, Refugees and Migration, with responsibilities for southern Africa. A career member of the Senior Foreign Service, Ambassador Garvelink received numerous Meritorious and Superior Service Awards and two Senior Foreign Service Presidential Meritorious Honor Awards. Ambassador Garvelink holds a bachelor’s degree from Calvin College and a master’s from the University of Minnesota. The presentation is a partnership between the World Affairs Council of Western Michigan and the Calvin Academy for Lifelong Learning (CALL). There is free admission for corporate members and educational partners of the Council and for all CALL members. A general admission fee of $10 is required of other attendees. Call 616-776-1721 or email [email protected] for more information.